Highlight on our Ropes/Adventure Course Chug! Why do we call our Alpine Tower ‘Ropes’ and what’s happening out there, anyway? Hi, and greetings from Rosh Ropes/Adventure Course Rosh Michael Gerber. I am in charge of the Alpine Tower and Climbing Wall here at Camp Ramah in New England, and thus in charge of giving your kids – and mine – a safe and fun climbing experience. 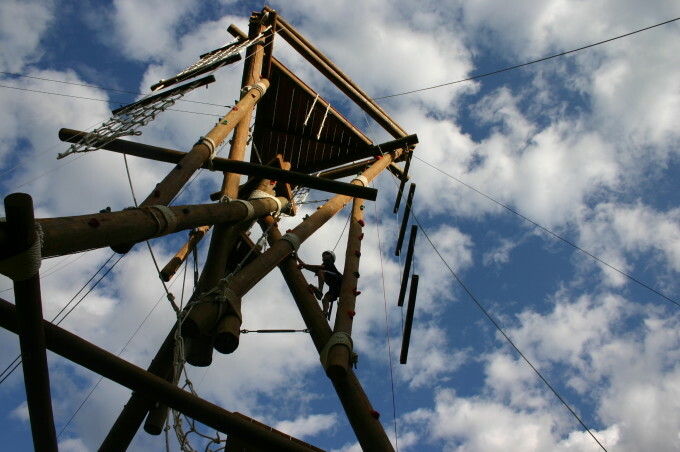 Our Alpine Tower is a free standing structure stabilized with guy wires. It’s built of telephone poles bolted with marine hardware, and studded with the same holds you’d find on a rock wall. The shape is roughly a triangular prism, and the easiest corner has the largest holds spaced closer together. On the most difficult corner, the holds are tiny indeed and further apart. It is built on its side and raised into position with a crane, and the top platform is about 55’ above the ground. That means your head is about 60’ off the ground if you stand up on it. And most of your children do stand up on it, and I am always amazed at their courage. 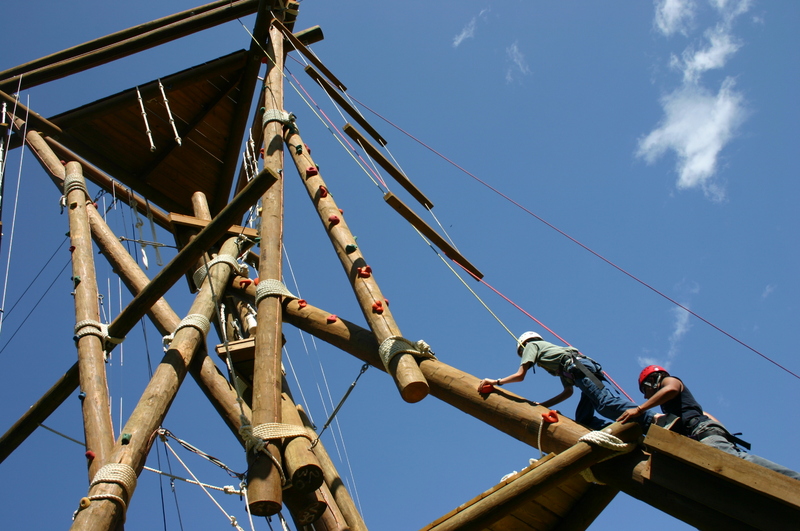 The belay is remarkably safe – far safer than driving to the ropes course. Climbing the tower is a challenge, and your kids meet the challenge. There’s a range between kids who are just these fearless spider monkeys, and campers who are slower, more thoughtful, maybe need encouragement from the ground. But the encouragement is there, and it’s incredible when they get to the top of the platform and enjoy the view and the breeze. But of course you should watch. When your kids climb they are strong and brave and resourceful and encourage each other, and I’m thrilled to be able to participate.